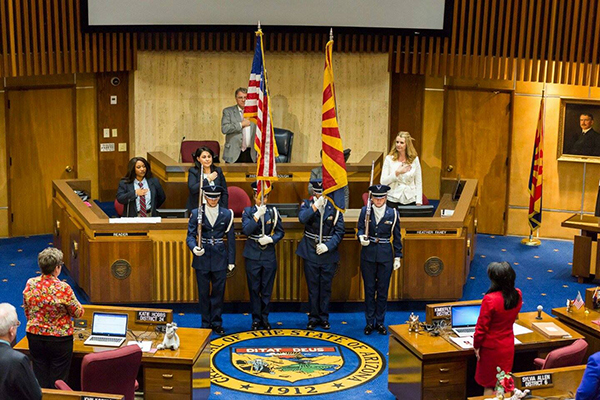 Thursday, the Maricopa High School Air Force Junior Reserve Officer Training Corps Honor Guard was invited by Sen. Steve Smith to present the colors at the beginning of the work day for the Arizona State Senate. The students in the Honor Guard were Steel Lewis, Hayley Mase, Dylan Hill and Alexander Odell. Ian Mase was the alternate. Sen. Steve Yarbrough, president of the Arizona State Senate said, “Thank you to the Maricopa High School Air Force Junior ROTC program. Well done.” The AFJROTC program is under the leadership of Lt. Col. Allen Kirksey and Master Sgt. Dishon Gregory.